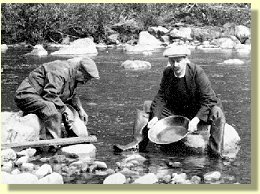 The gold pan is one the oldest and simplest tools used to find gold. A shovelful of dirt and gravel would be dumped into the pan. The pan would then be lowered into the water and gently moved in circles. Large stones in the pan would be thrown out, and the dirt broken up using the miner's fingers. As the pan moved in circles, muddy water and sand would float out of the pan, with the much heavier gold remaining at the bottom of the pan.